Official state fruit: the orange. You probably guessed that one. Official state beverage: orange juice. The Constitution should be amended to require that every state’s official beverage must be whatever comes out if you squeeze the official state fruit. As it is, it’s almost always milk, because BORING. But not in Florida. Official state anthem: “Florida, Where the Sawgrass Meets the Sky,” by Jan Hinton. This is actually just an optical illusion. 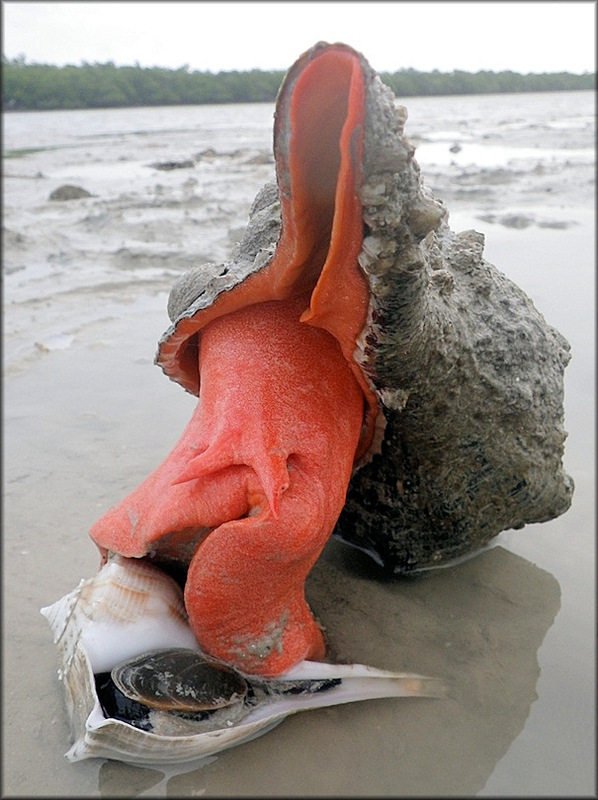 Official state shell: the horse conch (Pleuroploca gigantea). This is one of those official things that is technically out of date because scientists have changed their minds about what to call it. Since 1969, when the legislature made this the official shell, the scientific name has been changed to Triplofusus giganteus for reasons that make sense to scientists. As the name suggests, it is said to be quite large. Let’s see if we can find a picture of this OH HOLY CHRIST WHAT IS THAT? FLORIDA’S OFFICIAL STATE SHELL BELONGS TO A GIANT KILLER SEA SNAIL KILL THAT HORRIFIC MONSTROSITY KILL IT WITH FIRE! Sorry, now I see it’s only about two feet long, so big for a gastropod but not really dangerous, unless you’re also a gastropod, in which case YOU ARE SO SCREWED. Official state butterfly: the Zebra Longwing (Heliconius charitonius). Official state animal: the Florida panther. Probably Puma concolor coryi, although it doesn’t say, and maybe for good reason. Apparently what you call a Puma concolor depends on where you (and presumably it) lives: could be “panther,” “cougar,” “puma,” “catamount,” “mountain lion,” “painter,” or even “mountain screamer”; apparently most scientists call it the “puma,” although “mountain screamer” is clearly superior. Confusingly, the “panther” is not in the genus Panthera, which includes the bigger cats like lions (Panthera leo) and tigers (Panthera tigris). This is probably why most scientists call it the “puma,” despite the clear superiority of “mountain screamer,” a name that totally rocks. Anyway, everyone seems to agree that there are “panthers” in southern Florida (and I am now calling them “swamp screamers”), and that they’re endangered, but not whether they should be considered a separate subspecies. Also confusingly, there are no panthers in Carolina, except for the Carolina Panthers, who were put back on the endangered species list after Super Bowl 50. Trichechus manatus latirostris, the “West Indian manatee,” is the only candidate here. The manatee is not to be confused with the dugong, a different species that lives only in the other hemisphere. Manatees are indeed sometimes called “sea cows,” but please do not attempt to milk, ride, jump on, or otherwise molest manatees, as they too are endangered. See, e.g., “Man’s Inhumanity to Manatees” (May 30, 2013). Nope. Totally wrong in multiple ways. While people may “commonly” have trouble distinguishing between porpoises and dolphins at a glance, these are even differenter than manatees and dugongs. They are certainly related, but they’re not just different species, they’re in different families, which is like two levels up. So this is not even close. Porpoises do look similar to dolphins, but dolphins tend to be longer and leaner, with a longer snout and a slightly curved dorsal fin. They live in larger groups and are found all over the place, including in movies and TV shows. Porpoises are less streamlined (or “more portly,” as one source rudely put it), with smaller mouths and a triangular dorsal fin. But while it might be easy to confuse a porpoise with a dolphin at a glance, they aren’t remotely the same animals; you wouldn’t say “the porpoise, also commonly known as the orca,” which is about the same level of wrong. The other large problem is that while various kinds of dolphins live in Florida waters, porpoises do not. The closest one is the harbor porpoise, which lives (among other places) along the eastern seaboard, but only from Maine to the Carolinas. Of course it’s possible some occasionally get further south than that, but we’re talking about an official state animal here, so it’d be odd to pick a tourist. I think the only conclusion we can draw here is that Florida’s legislature meant to pick the dolphin as its official state marine mammal, but picked the porpoise by mistake because it did not know the difference. It didn’t pick the dolphin, it picked “the porpoise,” which doesn’t live there, and then confused it with the dolphin. This is just embarrassing and should be fixed. Official state (freshwater) reptile: the American alligator. Official state saltwater reptile: the loggerhead turtle, but only until July 1, 2018. The section has a “sunset provision” that repeals it on that date unless the legislature takes further action, so for some reason, the loggerhead turtle is on probation. Official state horse: the Florida Cracker Horse (Marshtackie), but only until July 1, 2018. Official state tortoise: the Gopher Tortoise (Gopherus polyphemus). Solid. The Gopher is a great tortoise and one of the absolute top reptiles, in my opinion. So could you stop eating them, please? According to Wikipedia, these were known as “Hoover chickens” during the Great Depression because so many people were eating them (easy to catch, you see), but this is now illegal. People apparently keep doing it, though. Sad. It is tempting to ask whether there are any other rodeos east of the Mississippi, but that would probably just reveal my rodeo ignorance. Official state Renaissance festival: The Italian Renaissance Festival in Vizcaya, in March. Unofficial Renaissance festivals may be infested with unlicensed troubadours, and should be avoided. Official state soil: Myakka fine sand (sandy, siliceous, hyperthermic Aeric Haplaquods). Bonus points: “The Haplaquods” would be a decent band name, although the band wouldn’t be together very long. That’s just the feeling I get. Official state pie: key lime. Source: Fla. Stat. §§ 15.01 et seq.